Federal and state land management agencies, as well as many local and regional planning departments, use the term “sustainability” in most every decision they make in today’s world. It has become the new “buzz word” in outdoor recreation as well. Each federal agency with land and wildlife oversight management responsibility is required to develop and update "management plans" of sustainable actions based on science. Whether it is good or “bad” science, we’ll leave to you; but if a program or concept is not sustainable, it will likely fizzle. Sustainability, the capacity to maintain, support or endure, is the goal. Motorized recreationists must learn to understand, employ and live with this concept of sustainability if motorsports are to survive in future generations of outdoor recreation. Wikipedia defines “sustainability” as the capacity to maintain, support or endure. In development (going back to 1987), “sustainable development is the development that meets the needs of the present without compromising the ability of future generations to meet their own needs.” (Brundtland Commission of the United Nations, March 20,1987). The rule requires each national forest or ranger district to designate those roads, trails, and areas open to motor vehicles. Designation includes class of vehicle and, if appropriate, time of year for motor vehicle use. A given route, for example, could be designated for use by motorcycles, ATVs, or street-legal vehicles. Once designation is complete, the rule prohibits motor vehicle use off the designated system or inconsistent with the designations. Designation decisions will be made locally, with public input and in coordination with state, local, and tribal governments. Designations are shown on a motor vehicle use map. Use inconsistent with the designations will be prohibited. All of these impacts can be mitigated with prescriptions developed in a coordinated resource planning fashion with community involvement. Each possible impact noted above requires mitigation through active prescriptions. By traveling responsibly and engaging in sustainable planning efforts, motorized enthusiasts can help mitigate these impacts, maintain access, and have a sustainable sport. Here are sample prescriptions from “A Look at the Elaho Valley From a “Motorized-Sports” Perspective” by Anna Terebka, Jeff Adamo, Liv Bly and Elke Van Breemen; Conservation 481: Conservation Planning & Wildland Recreation (see .pdf here at: http://www.ideal.forestry.ubc.ca/cons481/labs/3-5/MRG2.pdf). The use of trails may prevent harmful off-road practices that damage vegetation and fragile riparian areas. Noise pollution can be dulled with proper equipment, such as mufflers. Motorized vehicles will be required to undergo inspections to ensure that their emissions meet environmental standards. Signage and brochures will help to enforce appropriate behavior and promote little or no-trace camping. Educational handouts can be provided (free or via grants) at all trail heads. Volunteers can staff kiosks and trail head points to provide maps, guidance, educational materials, etc. while relieving land managers of that responsibility (and cost). Spill Kits are readily available and can be handed out (for free) to avoid pollution or contamination situations. Volunteer armies can be rallied and taught to construct water bars, erosion control devices, sediment traps and a variety of trail improvements to prevent water pollution and contamination. Trash bags are easily provided for litter removal and can be made available at trail heads or through supporting businesses. Protected or sensitive species such as Sage Grouse can be accommodated by timing of use, buffering, and season of year travel, where absolutely needed and no other prescription will suffice (See BRC Sage Grouse Prescriptions and Comment letters here: https://www.sharetrails.org/public-lands/10-state-sage-grouse-planning). Wildfires can be reduced by motorized travel where travelers are informed of emergency procedures, call-in numbers and equipped with basic firefighting (suppression) tools such as extinguishers. Transportation of invasive plant species can be eliminated by cleaning of vehicles (especially tires) as well as trail head inspections. Spanning more than twelve years, three administrations and numerous legal challenges, the 2012 Forest Service Planning Rule (http://www.fs.fed.us/rmrs/planning-rule-assessment/) laid out a vision of sustainability and community interaction that will be the Forest Service focus for the future. 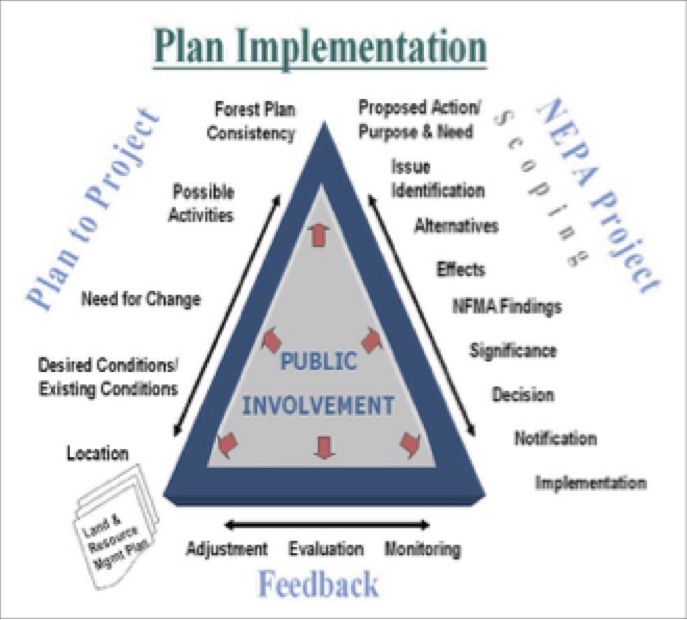 The Planning Rule is the process the Forest Service will use when developing their strategy (framework) for managing public lands under their stewardship to balance existing activities and future activities while ensuring the natural environment remains in good resilient condition. The TMR is a component of the overall process. Each federal agency with land and wildlife oversight management responsibility is required to develop and update "management plans". The Forest Service and Bureau of Land Management (BLM) have oversight management responsibility for a majority of public lands. Both have "rules" governing travel management and land management planning responsibilities – all headed towards sustainability. More will be written about this in future articles of this series, but it is important to note that sustainability is achieved through stakeholder involvement, adaptive resource management and monitoring, all of which need to be understood by the motorsports enthusiast. Between the media, the various land management agencies, and the vocal and well-funded PR campaigns by anti-access groups, the concept of sustainability has taken a foothold that will not falter. Motorized recreationists must accept the fact that sustainability is the future. Community Involvement is the Foundation for Sustainability. In the past, public involvement was limited to the required meetings where the agency would follow the procedures laid out in the National Environmental Policy Act (NEPA – more on NEPA here: http://www.delalbright.com/access/nepa_intro.htm). While the tenets of NEPA still apply, the newer planning processes call for a more in-depth commitment of involvement from the local community and interest individuals — stakeholders. Stakeholder involvement is a crucial element of the Planning Rule, which also focuses on resiliency and sustainability. OHV activities (off-road, backcountry, off-pavement, motorized recreation) must be an integral part of all stakeholder efforts where sustainability is discussed. Under the new resiliency and sustainability planning directives, there is a focus on stakeholder involvement on the “left side of the NEPA triangle”, actions previously held as agency responsibility. Under this model, stakeholder interaction is critical. This is when the proposals that are presented to the public for review and comment are developed. Early and active involvement improves the chances of having a proposal that addresses off-highway/motorized recreation concerns. Quiet Warrior Racing (Don Amador) has written on the subject and reviewed websites and programs about sustainable trails. For a clear and relatively simple explanation in video form, please review the Sustainable ATV Trails program and interactive slide show that gives excellent examples of the relationship between soil and water, and what we can do about it to have sustainable motorized sports. What Does Sustainability Mean to the Motorized Community? Motorized enthusiasts must engage fully in sustainable dialogue and planning efforts, which includes being part of all stakeholder groups where the future of outdoor recreation is on the table. Associations, clubs and motorized recreation group leaders must train members in the meaning, use and future of sustainable planning and stakeholder involvement. Being involved, or being a stakeholder, establishes new networking opportunities in activities other than your primary modality. For example 4x4 folks come in contact with ATV and dirt biker concerns, and vice versa. Sharing ideas and building alliances leads to a stronger stakeholder presence. Trail maintenance and erosion control measures can be conducted by volunteers in a sustainable fashion if properly planned for and executed. Other trail and riding area mitigation concerns can be funded and conducted by volunteers the same way, just like the example set by Friends of the Rubicon. When a land management agency claims they do not have the staff, funding or resources to sustain a motorized opportunity or road/trail system, volunteers and their supporting associations must step up and provide that sustainability – grant money, donated materials and shovel-bearing volunteers. There is no use trying to ignore or fight the “system” where sustainability is being used by land management agencies. Sustainability, the capacity to maintain, support or endure, is the goal. Reaching that goal is through stakeholder involvement, adaptive management and monitoring. Sustainability is the new buzz word and all motorized enthusiasts (stakeholders) must engage in this concept or be left outside a closed gate. If motorized outdoor recreation is not considered sustainable, it will be considered history. Get involved; be involved; it is your sport and your future. Last edited by outdoorwire; 09/11/15 06:19 PM.